(Sebastian:) How could we define "distance" on a goban? Is x Further than c from the Marked Stone? In the discussion of one opening (unfortunately I forget which one) it was argued that x is further from than c - or was it the other way round? Anyway, is there an empirical way to compare distances? Intuitively, one might say that a is further than c, and c is further than b. 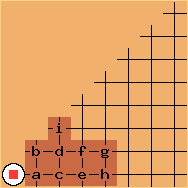 But since the only valid connections in Go are the rectangular lines of the goban, it appears we should use Manhattan distance, which would regard a and c as equally far from . HolIgor: [...] please, look if you can combine [the two pages]. (Sebastian:) Gladly, if someone can confirm that Manhattan distance (and the Bronx variant mentioned there) is the agreed way to measure distances in Go. On the other hand, it is said that the black stones are connected more safely than the white stones - should they be considered closer? kritz Not to complicate the discussion, but "relatively," aren't two stones on the third line "closer" than two on the fifth line? By this I mean - easier to connect/defend. (Sebastian:) You're right, this makes it hard to define distance simply as the difficulty to connect. For large distances (such as in the opening diagram), a distance concept should in some way fit to strategical considerations. Another pitfall this could introduce is dependency on direction relative to the shape of formations. I was looking for a simple concept, and was hoping that the behaviour of two single stones is at least a reasonable guideline for estimating other distances. But maybe that would be hopelessly misleading? 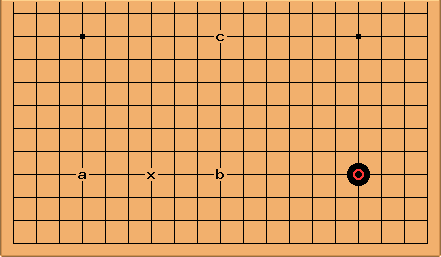 Bill: In any event, a kosumi (on an otherwise empty board) is connected, while a one-space jump is, in general, not, although the Manhattan distance of both is 2. (Sebastian:) Maybe it helps to rank distances in this diagram. The idea is to fill it with all connections to the marked stone, arranged in alphabetical order of strength.